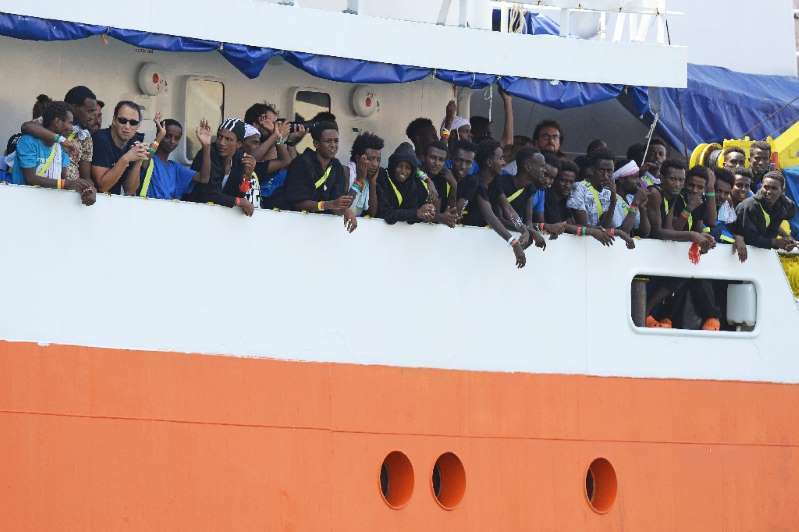 Two charities on Sunday lambasted Italy for pressuring Panama into revoking its flag from migrant rescue ship Aquarius, warning the move deals a "major blow" to humanitarian missions off Europe's southern coasts. SOS Mediterranee and Doctors without Borders (MSF) said they were "reeling" from Saturday's announcement by the Panama Maritime Authority that it must revoke the registration of the ship owing to what the NGO's termed "blatant economic and political pressure from the Italian government". "This announcement condemns hundreds of men, women and children who are desperate to reach safety to a watery grave, and deals a major blow to the life-saving humanitarian mission of the Aquarius, the only remaining non-governmental search and rescue vessel in the Central Mediterranean," the NGOs stated. They urged European governments to "allow the Aquarius to continue its mission, by affirming to the Panamanian authorities that threats made by the Italian government are unfounded, or by immediately issuing a new flag under which the vessel can sail". Italy's foreign ministry did not comment when contacted by AFP. Panama said it was revoking its flag owing to "non-respect" of "international legal procedures" relating to migrant rescues in the Mediterranean. Aquarius spent 19 days docked in the French port of Marseille after Gibraltar revoked its flag last month. It set sail again last week after first acquiring Panamanian recognition. But Panama then launched "an official revocation procedure" after Italian authorities complained Aquarius's captain had "refused to return migrants and refugees back to their point of origin." Aquarius had Thursday picked up 11 migrants off the coast of Libya but refused to take them back to the North African country and instead went in search of an alternative port. The vessel has been operated by charities SOS Mediterranee and Doctors Without Borders since 2016. Italian authorities said Friday it was "floating in the Mediterranean" but that it wasn't welcome to dock in Italy. The Aquarius has been banned from Italian ports since June, when Interior Minister Matteo Salvini decided the country would take in no more migrants. He tweeted Thursday the boat could go wherever it wanted "but not to Italy". In a statement, the two NGOs said the Aquarius "meets all maritime standards and is in full compliance with rigorous technical specifications as required under the Panama flag". It denounced Rome's action as "further proof of the extent to which the Italian government is willing to go to, knowing that the only consequence is that people will continue to die at sea and that no witnesses will be present to count the dead". Karline Kleijer, MSF's head of emergencies, said EU leaders "appear to have no qualms implementing increasingly abusive and vicious tactics that serve their own political interests at the expense of human lives. "This tragedy has to end," Kleijer added.